Hello there how is your week going? Not long and we will be saying TGIF again, time is flying for sure. Today I am sharing some cards I sent out to my promoting Passionettes earlier this week, and I cased one of the projects Shelli’s daughter, Sara shared HERE. Yummy combo of Melon Mambo, Pool Party and Very Vanilla to coordinate with the fabulous Newsprint Designer Paper. Two of our butterfly punches were layered up one punched from designer paper the other stamped in pool Party ink and punched out with the new butterfly punch available in the Spring- Summer catalogue. 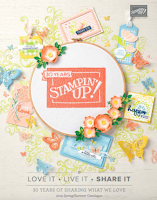 Want to find out more about joining the Stampin’Up! Family and becoming a Passionette? Read more info HERE then get in touch for a friendly no nonsense chat. Joining is easy and if you sign before 22 March you can choose £162.50 worth of products of your choice for only £99, how’s that for a total start up cost of a business?